First up, a clear warning. Given that I’m about to go into some detail regarding the contents of the first fifteen minutes - and a bonus five minute action sequence - of Assassin’s Creed, this article contains a word starting with ‘s’ and ending in ‘s’. No, not stabbings or even slayings, although there’s a fair bit of those too. 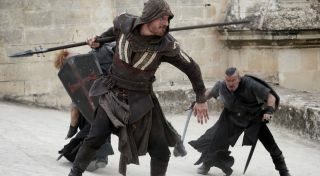 Yep, some spoilers lie ahead for the Assassin’s Creed movie so if you want to go in as cold as one of new Spanish Assassin Aguilar’s Templar victims, it’s time to go back to polishing your hidden blade. Still with me? Final chance to save yourself. This is your last chance before I plug you into my own personal animus. Don’t worry. It won’t hurt. Much. Assassin’s Creed is no Resident Evil or Tomb Raider. From the swooping opening eagle-style shots flying over the New Mexico desert, to the work in progress action sequences I see from later in the movie, this is the gritty and beautiful work of a man who’s come straight off working on Macbeth and is confidently turning a video game into something we actually want to watch. Justin Kurzel isn’t blinkered by focus on making a movie for fans of a game. His eyes are thankfully on the bigger picture and while there’s plenty of eagles and rooftop free-running just like the trailer, there’s far more going on under the surface than you’d expect. In a reverse of Kurzel’s previous Shakespeare work, Assassin’s Creed starts with tragedy. Callum Lynch’s beginnings are explored at the get go and while I’m not going to spoil them here, there’s an interesting twist that instantly sets the tone of a murky moral soup of Assassins and Templars in the modern day and 15th century Spain. Things are going to get messy. He definitely does. Following the general theme of each of the games, her dear old Templar pa wants to find what is only referred to as ‘the Artefact.’ Given that Aguilar was the last Assassin to have his hands on this mystical tech back in the Spanish Inquisition when the Templars originally wanted it, Callum is the key to finding exactly where it’s hidden. Abstergo desires complete control, the opposite of the Assassins quest for freedom and it’s going to be interesting to see what Rikken has in store. The first fifteen minutes also shines light on the way Abstergo works in the 21st century. Lynch isn’t the only Assassin in there and this collection of the Brotherhood potentially won’t end too well for the modern day Templars. The Wire’s Michael Kenneth Williams takes on the role of Moussa, the first Assassin Lynch meets in a bizarre garden recreation within the heavily guarded walls of the Abstergo complex. What I see of Moussa isn’t much - he whispers to Lynch to jump out of the building while he still can - but Williams has revealed a little more. “[He’s the] trickster. He’s the ringleader of the Assassins in Abstergo, and he sees everyone’s gifts and recognises their potential,” he explains. “He’s from a Caribbean ancestral background, and he’s a Voodoo poisoner. He has all that energy behind him. Can he fight? Yes. But would he rather sprinkle something in your tea and kill you softly? You bet.” Other modern day Assassins include a Chinese Assassin called Lin who intriguingly descends from an “Assassin she discovers in her genetic regressions, who is well travelled and hardened by the struggles of life for a woman in 16th century China.” Given that Assassin’s Creed Chronicles China starred Shao Jun in 1505, I don’t think it’s too much of a leap of faith to say that we’ve got a nice game crossover here. The fact that there’s intriguing characters such as Moussa, Lin and other Assassins in the 21st century sequences of the movie means that Kurzel and Fassbender clearly want a better balance than we’ve had previously in the games. What the movie calls ‘regressions’ into Lynch’s past where we’ll see the Siege of Granada amidst the Spanish Inquisition and the burnings of the auto-de-fe, won’t be the only attraction. I didn’t see his first trip into the newly updated Animus but this new version of the genetic time travel machine is a serious upgrade. A giant mechanical claw that grips the subject around the waist, it looks considerably more intimidating than the game’s previously tame sofa. The replication of Aguilar’s movement too means the Bleeding Effect is more understandable as Lynch literally goes through the motions of his Assassin ancestor. Speaking of, the preview of the action that awaits amidst the Spanish inquisition was a frantic and fast paced dose of violent combat. Kurzel’s camera hovers dangerously close to the action as Assassins Aguilar and Maria effortlessly dispatch slews of enemy soldiers across rooftops and balconies. They smash through doors, and finish off their foes crunchily with throwing knives. There’s a few interesting shots too as the camera looks down bow sights and travels with arrows. This isn’t about hanging around a few metres behind an Assassin and watching them run. We’re in the thick of it. Despite being work in progress sequences - ropes can still be glimpsed and some CG towers are still grey on the skyline - it’s an impressive eyeball assault. Fassbender and French actress Ariane Labed have clearly gone through intense physical training. I don’t even catch a glimpse of the rest of the history that awaits in the 15th century but the trailer shows seas of soldiers as part of the Siege of Granada. Just like the historical franchise we’re going to be seeing real historical characters who were part of the Spanish Inquisition such as grand inquisitor Tomas de Torquemada played by Javier Gutirrez. This was a bloody and chaotic time and Kurzel is making sure we feel every part of it. After Macbeth and what I’ve seen, I’ve no doubt he has what it takes here. This is only 20 minutes of footage but so far, I’m happy. A new time period, new Assassins and a clear attitude that this has to work as a piece of cinema are all filling me with a confidence I didn’t know was possible. So far Assassin’s Creed is beautiful and has a focus on its characters I just didn’t expect. Fassbender and Kurzel can do this. It’s time for a real leap of faith.